When You, a recycler customer, submit a Registration form to Used-Car-Parts.com, Inc., dba Car-Part.com ("Car-Part.com"), in writing or online, You are deemed to agree to all of these Terms and Conditions. Any different or additional terms and conditions you might add to Your Registration or related documents are expressly objected to by Car-Part.com and not binding upon it. Car-Part.com reserves the right to accept or reject all Registration forms received by it. 2. Description of Our Services. The following paragraphs describe Car-Part.com's services, and the terms that apply to each of them. Your Registration form specifies which of these services you will receive. If you are not receiving a service, the provisions relating to that service do not apply to you. If Car-Part.com provides other products or services to you from time to time, this Agreement will also apply to those products and services unless Car-Part.com otherwise specifies in writing. a. Web site design/development services. Car-Part.com will design a web site of the type specified in the Registration. A "basic" Web site consists of a home page with Your logo (if you provide one), and a search page. 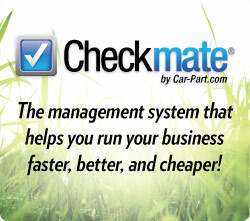 Additional features will be added as agreed by You and Car-Part.com from time to time. b. Web site name set-up. Car-Part.com will apply for the domain name(s) you specified in the Registration. The domain name registrar decides whether you will actually be given that domain name, and there is no guaranty that you will receive it. If you do not, Car-Part.com will assist you to find an available domain name. It is Your responsibility to ensure that your chosen name does not violate a trademark or other right of a third party. Your rights in the domain name are subject to the rules of the domain name registrar. Car-Part.com will obtain those rules for you on request. Domain names must be renewed with the registrar after two years. You have the responsibility for renewing Your domain name and paying the appropriate fee. Car-Part.com will assist you in this process if You wish. c.	Web server set up. Car-Part.com will set up Your web site (if Car-Part.com is hosting your web site) and your parts search capability on Car-Part.com's server. This is a required, one-time service. d.	Host web site with inventory. Car-Part.com will host Your web site on its servers and will include your inventory in its master database, so that your inventory will be searchable from the inventory search feature on your web site. You are responsible for providing Your inventory information to Car-Part.com in the manner and format required by Car-Part.com. Car-Part.com provides upload software to assist you with this, as described in Section 4.
e.	Add an Inventory Search to Your web site. If Car-Part.com is not hosting your web site, Car-Part.com will work with your ISP and Web site designer to add an inventory parts search capability to your web site, in a manner deemed most appropriate by Car-Part.com. You are responsible to assure that each such other person or firm gives Car-Part.com its cooperation to implement this capability. f.	Publish Your inventory on Car-Part.com. 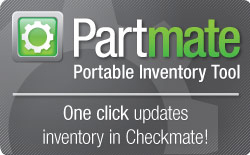 Car-Part.com will make your inventory information available to visitors performing a parts search on the Car-Part.com site. You are responsible for providing Your inventory information in the manner and format required by Car-Part.com. g.	Publish Your Inventory on other consolidated sites. If you are a member of a state recycler association or another consolidated group of recyclers and Car-Part.com hosts that organization's site, if you so choose and the organization consents, Car-Part.com may include your inventory in the inventory search feature on that organization's site, if it has one. The same rules apply as for including your inventory on the Car-Part.com site. h.	E-mail accounts. Car-Part.com will provide the number of email accounts specified on your Registration form, with names you select, and using your primary domain name (ex. yourname@yourdomainname.com). If Car-Part.com hosts your web site or email, You agree that you will use your web site and email accounts hosted by Car-Part.com only for lawful purposes. Scandalous, libelous, prurient, or offensive material, and material Car-Part.com, in its sole discretion, finds not suitable to the site, is not permitted on Your web site. If such material is discovered on Your site, Car-Part.com may immediately remove that material or take down your site. Car-Part.com will give you five (5) days to correct the problems Car-Part.com has identified, except as provided later in this section 3. Failure to do so, or repeated violations of this provision, shall entitle Car-Part.com to remove your site from its server and cancel this Agreement immediately, with no refund of any fees. Car-Part.com does not intend to actively monitor your site, so compliance with all the restrictions in this section is your responsibility. You are further responsible to make sure that all laws and regulations, including but not limited to the copyright and trademark laws, are adhered to on your web site. It is also Your responsibility to obtain whatever Trademark, Copyright, or other permissions are required for your site, and Car-Part.com will assume you have done so. As provided by federal law, if Car-Part.com receives notification of a claim of copyright infringement regarding Your site, Car-Part.com may immediately take down the allegedly infringing material without liability. You must follow the provisions of 17 U.S.C. § 513(g) for replacement of the material. You agree not to send unsolicited bulk email from any email account provided by Car-Part.com. If You do so, Car-Part.com can immediately terminate Your email account(s) and/or this entire Agreement. Upon acceptance of this contract, and the installation of Your web site, Car-Part.com shall give you instructions on how to access the site and upload your inventory to the site, unless your inventory is being transmitted to Car-Part.com from your inventory management system provider or another third party. Uploading inventory is Your responsibility. If You have technical problems uploading your inventory, you agree to notify Car-Part.com immediately, and Car-Part.com will endeavor to assist you through telephone support. Car-Part.com provides You with software for uploading inventory; this software is the property of Car-Part.com, and you must delete it from Your computers and return all copies of it to Car-Part.com when this Agreement terminates. All software provided to You is licensed to You subject to the terms of the license agreement for that software. You agree that Car-Part.com may display your inventory information, identifiable as your inventory, in connection with the auto parts search services provided by Car-Part.com. All sales of parts on your web site and the Car-Part.com site(s) are sales directly between you and the buyer, and Car-Part.com is not a party to those sales. Car-Part.com does not investigate buyers, and accepts no liability for buyers' breach of their obligations to you. Car-Part.com cannot ensure that a buyer will actually complete a transaction. Please use common sense and practice safe selling practices when selling online. You are directly responsible to the buyer for warranties and for any refunds, credits or adjustments to a transaction, in accordance with your contract with the buyer. The Internet is an evolving technology, and access to the Internet is sometimes unavailable. Car-Part.com does not guaranty continuous, uninterrupted or secure access to any sites or search or services it hosts. Car-Part.com shall not be responsible for failure of your computer, Your connection to the Internet, or services provided by Your Internet Service Provider. Car-Part.com is not providing You with a connection to the Internet and you must have an account with an Internet Service Provider to access the Internet and Car-Part.com's services. Car-Part.com shall not be responsible for any problems beyond its control, including problems with Car-Part.com's Internet connection caused by factors outside Car-Part.com's control. Car-Part.com will use commercially reasonable efforts to maintain its servers always in operational condition; but THE SERVICES, AND ALL SOFTWARE PROVIDED TO YOU BY CAR-PART.COM, ARE BEING PROVIDED AT YOUR SOLE RISK AND ARE PROVIDE ON AN "AS-IS," WHEN AVAILABLE BASIS WITHOUT WARRANTIES OF ANY KIND. CAR-PART.COM HEREBY DISC LAIMS ALL WARRANTIES, EXPRESS OR IMPLIED, INCLUDING IMPLIED WARRANTIES OF MERCHANTABILITY AND FITNESS FOR ANY PARTICULAR PURPOSES WHATSOEVER. YOUR SOLE REMEDY, AND CAR-PART.COM'S EXCLUSIVE LIABILITY WHETHER ARISING IN CONTRACT, TORT (INCLUDING NEGLIGENCE), STRICT LIABILITY OR ANY OTHER LEGAL THEORY IS LIMITED TO REFUND OF THE FEES PAID TO CAR-PART.COM. INCIDENTAL OR CONSEQUENTIAL DAMAGES, LOST PROFITS, LOST SALES OR ANY OTHER INCIDENTAL LOSS ARE EXCLUDED. You agree to indemnify and defend Car-Part.com, including attorney's fees, against any action initiated against Car-Part.com related to your web site or to your activities related to the other web sites from which your inventory is searchable, including the Car-Part.com web site. This agreement shall be valid for three (3) months, and shall continue thereafter until either party terminates by giving notice to the other party. Fees paid to Car-Part.com are non-refundable. The parties can mutually terminate this agreement at any time by a writing signed by both parties. Car-Part.com may change the terms of the Agreement by giving You 30 days notice of the change. If you object to the change you can cancel this agreement by notifying Car-Part.com within that 30-day period. Car-Part.com may from time to time adopt policies related to its services. Each policy will be binding on you, unless you terminate this Agreement within 30 days after you are first notified of such policy. All notices required under this agreement shall be sent to Car-Part.com at its headquarters as then shown on its web site, and to You at the address you stated on the Registration form. If You change your address you must notify Car-Part.com in writing. Notices under 17 U.S.C. § 513 shall be sent to the designated agent for such notices identified on the Car-Part.com website (www.Car-Part.com). All fees are payable in advance and non-refundable, and do not include taxes, if any, which will be in addition to the fees. Car-Part.com may change any fees by providing thirty days notice of such fee change. Such changes shall not take effect until the next billing cycle after the notice is given. If you fail to pay your fees when due, Car-Part.com may terminate this Agreement and terminate its services, including removing your web site. The Car-Part.com Web Development Guide, user Id and password to the Web Development Guide, and the Inventory upload procedures, filenames and user ID/password to the Inventory upload procedures, and software (all referred to as "the Documentation") are particularly sensitive Confidential Information and Trade Secrets of Car-Part.com, You shall use the Documentation solely for the purpose of uploading Inventory to Car-Part.com. You shall not disclose, (except as required by law) use or permit the disclosure or use by others of the Documentation for any other purpose. You shall not use the Documentation to create software or services that perform the same or similar function as any Car-Part.com products and services. You agree to: (a) keep the Documentation confidential; (b) maintain agreements with Your employees and agents that protect the confidentiality and proprietary rights of the Confidential Information of third parties such as Car-Part.com and instruct Your employees of these requirements for the Documentation; (c) restrict disclosure of the Documentation to those of Your employees who have a "need to know" consistent with the purpose for which such Documentation was disclosed; (d) not to remove or destroy any proprietary or confidential legends or markings placed upon the Documentation; and (e) not to disclose the Documentation to any web hosting provider, software developer, or yard management system provider. You agree that in case of a breach of this Section 10, damages may be immediate and irreparable, and injunctive relief is appropriate. Car-Part.com will not give any of your individually identifiable data (data that can be identified as Your data) to any third party without Your permission. Car-Part.com reserves the right to make available aggregate data (data that comes from many sources and is combined for statistical or other purposes and does not reveal the identity of the persons that provided specific data) to third parties. Pursuant to the terms and conditions of the license agreement between Cooperative Computing, Inc® ("CCI") and Car-Part.com ("License Agreement"), Car-Part.com grants, and You accept, a non-transferable, non-exclusive and terminable sublicense (i) to receive and use the Hollander Interchange database ("CCI Product") solely in connection with Car-Part.com's services described in Section 2 hereof ("Car-Part.com Product"), (ii) to transfer to Car-Part.com parts inventory data using the Hollander Interchange including the Hollander Inventory Numbers, and (iii) to include on internet site(s) the Car-Part.com Products including parts searches using the Hollander Interchange. You receive no right to use the CCI Product except by the grant of this sublicense by Car-Part.com (but this does not invalidate or otherwise affect any rights related to the Hollander Interchange that You may have under any other licenses or agreements); and neither Car-Part.com nor CCI grants any CCI Product license whatsoever, either explicitly or implicitly, except pursuant to this Agreement. You agree to comply with the terms and conditions of this Agreement and agree not to use the CCI Product except as provided in this Agreement. Notwithstanding anything else herein to the contrary, under no circumstances may You distribute, make available or otherwise provide access to, to any third party, any data or information which would enable the Hollander Interchange to be readily copied in whole or substantial part. You represent and warrant that you have a valid sublicense to the Hollander Interchange in connection with the inventory management system used by you. If at any time you fail to have such a valid sublicense, you must immediately notify Car-Part.com, and Car-Part.com may immediately terminate this Agreement. You shall not use the CCI Product directly or indirectly except in connection with the Car-Part.com Product. You further agree that You will not utilize any part of the CCI Product on behalf of any third party or otherwise: (i) to reformat any CCI database product; (ii) to extract data from any CCI database product; (iii) to analyze or reverse engineer any CCI file formats; or (iv) for any other purpose not specifically permitted under this Agreement. You agree to implement any updates provided by Car-Part.com to You that (i) incorporate additional security features ("Licensing Updates") or (ii) provide updated or revised data for the Hollander Interchange ("Data Update").. The term of any sublicense granted hereunder shall commence on the effective date of this Agreement and shall be valid until the sublicense is terminated as provided herein. Upon the termination of this Agreement for any reason, all rights and licenses granted hereunder to You shall immediately cease and You shall immediately return to Car-Part.com or CCI, at your own expense, all CCI property including, but not limited to, all copies of the CCI Product and related documentation that have been delivered to You, if any. The sublicense granted under this Agreement will terminate immediately without notice from Car-Part.com or CCI if You fail to comply with any provision of this Agreement. You understand and agree that this Agreement may, at CCI's sole discretion, terminate upon expiration or termination of the License Agreement between CCI and Car-Part.com. In addition, CCI may terminate this Agreement without liability in the event of a material breach of this Agreement by You. You agree that the CCI Product and all related materials, and all copyrights, patent, trade secret and other intellectual and proprietary rights therein, are and remain the property of CCI and its suppliers. You agree to protect the CCI Product and related materials from unauthorized disclosure or use. You shall indemnify and hold Car-Part.com and CCI harmless for any claims, damages, or liabilities arising out of or based on any claims by a third party arising from, based on, or related to a breach by You of this Agreement. THE CCI PRODUCT IS PROVIDED TO YOU ON AN "AS IS" BASIS. CAR-PART.COM AND CCI MAKE NO REPRESENTATIONS OR WARRANTIES, EXPRESS, IMPLIED OR STATUTORY, WHATSOEVER TO END USER. IN PARTICULAR, CAR-PART.COM AND CCI, AND THEIR SUPPLIERS AND AGENTS ACTING ON THEIR REQUEST, DISCLAIM ANY WARRANTY OF FITNESS FOR A PARTICULAR PURPOSE, MERCHANTABILITY OR NON-INFRINGEMENT OF THIRD PARTY RIGHTS WITH RESPECT TO THE CCI PRODUCT. NEITHER CAR-PART.COM, CCI NOR THEIR SUPPLIERS WARRANT THAT THE CCI PRODUCT WILL SATISFY THE BUSINESS REQUIREMENTS OF END USER OR THAT THE CCI PRODUCT IS WITHOUT DEFECT OR ERROR OR THAT THE OPERATION OF THE CCI PRODUCT WILL BE UNINTERRUPTED. CAR-PART.COM AND CCI, AND THEIR SUPPLIERS AND AGENTS ACTING ON THEIR BEHALF, SHALL NOT BE LIABLE TO END USER FOR ANY INCIDENTAL, SPECIAL OR CONSEQUENTIAL DAMAGES, INCLUDING, WITHOUT LIMITATION, ANY DAMAGES RESULTING FROM LOSS OF PROFITS, DATA OR GOODWILL, WHETHER SUCH DAMAGES OR LOSSES ARISE IN CONTRACT, TORT OR OTHERWISE, OR ARE SUFFERED DIRECTLY OR INDIRECTLY, EVEN IF CCI OR CAR-PART.COM IS INFORMED OF THE POSSIBILITY OF SUCH DAMAGES IN ADVANCE. You shall not assign, license, sublicense, transfer, pledge, or otherwise dispose of this Agreement, the CCI Product, or any interest herein. You agree to look only to Car-Part.com for any support, maintenance, assistance, or the like with respect to the CCI Product and the Car-Part.com Product. CCI is a third party beneficiary to this Agreement to the extent that this Agreement relates to the CCI Product. You acknowledge and agree that such provisions are made expressly for the benefit of CCI and are enforceable by CCI in addition to Car-Part.com. This agreement shall be interpreted under the internal laws of the Commonwealth of Kentucky. You agree that if you initiate any litigation related to this Agreement or your relationship with Car-Part.com, the state and federal courts in Kenton County, Kentucky will have exclusive jurisdiction over that litigation. This Agreement and the Registration form constitute the entire agreement between You and Car-Part.com, and any prior proposals, offers, negotiations, or agreements not contained there are hereby void and of no effect. Any changes to this agreement, except as provided in Sections 7 and 9, shall not be effective unless made in writing signed by both parties. In the event that any one or more provisions contained in this Agreement should for any reason be held to be unenforceable, such enforceability shall not affect any other provision of the Agreement, but the Agreement shall be construed as if such unenforceable provisions had not been contained herein. LEARN MORE ABOUT OUR TOOLS FOR RECYCLERS or CONTACT YOUR REP TODAY!